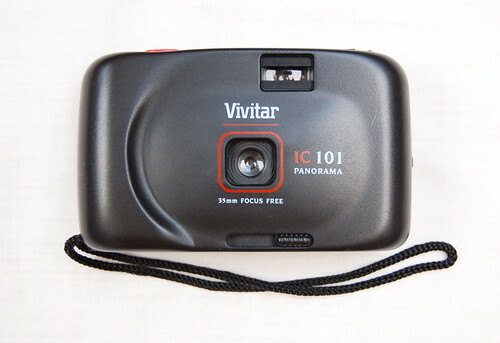 Among the many plastic "focus free" 35mm cameras sold by Vivitar, the IC 101 is unusual in being permanently fixed in a panoramic image format. The camera has a fixed focus 28mm lens, fixed 1/125 shutter speed and f/8 aperture. There is no flash hot shoe. The camera came in two color variants, all black and all silver. 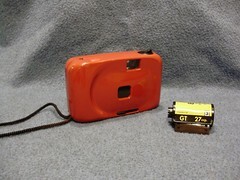 As with other plastic 35mm panoramic cameras (such as the Ansco Pix Panorama), the panoramic image is not achieved by exposing a wider image than the standard 24 x 36 mm frame. Instead, the film gate is permanently masked to an image size of 13 x 36 mm, blocking much of the film area. Photo processors were expected to enlarge this cropped image into wider-than-standard prints. 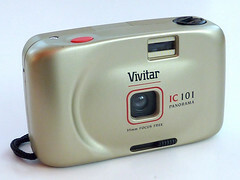 "As junk cameras go, the Vivitar is a real Cadillac. 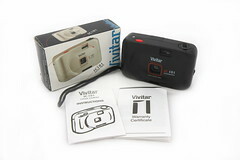 Unlike, say, the Special Moments Focus Free camera, the Vivitar is small, compact, and solidly built. 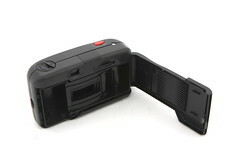 It features a frame counter – a tremendous luxury for a camera of this class. It also has a protective lens cover, that locks the exposure button so you can’t take accidental shots (maybe not such a great feature). It also has a curved back plate – apparently an attempt to correct for some of the spherical aberrations caused by the focus free lens." Some users make modifications to the IC 101 including removing the panoramic masks, sometimes leaving rough edges in the plastic to create borders on the resulting photos. Other possible modifications including adding multiple exposure capability, and adding additional frame masks (sometimes called splitzers). Manufactuers: unknown, marked "Made in China"
This page was last edited on 25 July 2017, at 02:17.